An extremely stable all weather tent with full canopy outerfly - having many features , i.e. both side door - both side vestible - both side netted additional doors - PU coated 600 Denier Polyester fabric ground sheet - 22 mm T5 Aluminium poles in A shape with a connector to place the ridge pole . Toughest anodized steel pegs provided . 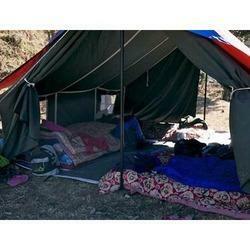 These military tents are specifically designed and developed for camping & trekking. We offer them in different shapes and sizes to meet the specific usage requirements of the clients. Further these are manufactured using qualitative materials including canvas/nylon taffeta to provide in them durable finish quality. We are dealing in Nylon Tent. Made of nylon fabric pu coated with inner fly of pc of same shade . It is waterproof and has capacity to accommodate 3 people with their personal kit. it is light and man portable provide with a waterproof flooring which spreads itself with the tent . It is provided with two msh screen entry points through which adequate ventilations is available. Tents are made out of canvas cloth, awning fabrics, nylon fabrics etc., Tents are used for Temporary shed, shelter, etc. Different types of Tents are Labour Tents, Military Tents, Hill Tents, Single Ply Tent, Double Ply Tent, Swis Cottage Tent(contains dressing room, bed room, bathroom etc., ), Canopy Tents, etc. In order to meet huge market demands, we are involved in presenting huge array of Nylon Tent. This Nylon Tent is available in market in different sizes and specifications. Further, our professionals ensure to satisfy the entire requirements of the customers in all manners. Our products are of world class quality.